Chimpanzees (Pan troglodytes), from West and Central Africa are members of the Hominidae family, along with gorillas, humans and orangutans. 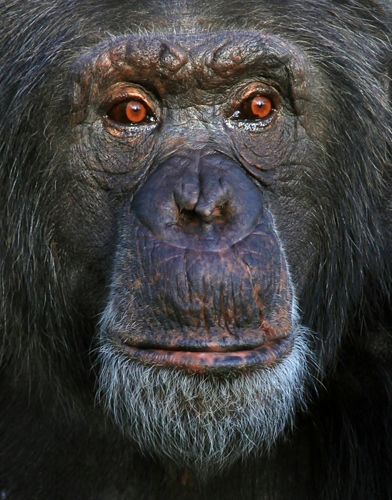 This particular Chimp shows his age by the grey in his beard, but still has a bright fire in his eyes. Males can grow to 5.5 feet and weigh up to 150 lbs. they live in large multiple-male and multiple-female social groups called communities. Social hierarchy’s exist within the community and are dictated by the position of an individual and their influence on others. In 1960, Jane Goodall discovered that Chimpanzees used tools, and now it is believed that they have done so for some 4,000 years. Chimps communicate in a manner similar to human nonverbal communication, using vocalizations, hand gestures, and facial expressions. This one was clearly looking at me while I was looking at him.